Most third-party app integrations in GoFormz are managed via app connections. An app connection allows GoFormz to communicate with the third-party app. To establish an app connection, you must provide GoFormz with the credentials for logging into the third-party app, which typically include username and password, but may also include app-specific information like a custom subdomain. Once you have established an app connection, you can use workflows to build integrations between GoFormz and your app. An app may have multiple connections. For example, you may have two different Egnyte accounts for different parts of your business, so you may want to upload all HVAC-related forms into one account and all electrician-related forms into a different account. To accomplish this, you would set up two Egnyte connections, and then configure the appropriate workflows for each connection. App connections are managed via the App Connections screen, shown below (the exception to this is the Box integration, which is managed via a different screen). This is where you can create, delete, view and modify your connections. To access the App Connections screen, expand the More dropdown at the top of the GoFormz web interface and select Connected Apps. The App Connections screen lists all third-party app integrations that are available, along with a brief description of what each one does. You can click on an app name to view a list of existing connections for that app, or click Add Connection to create a new connection. 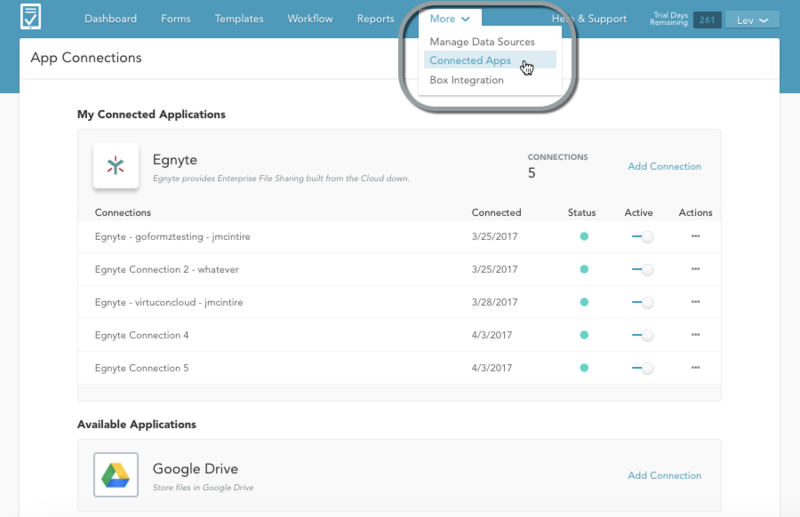 In the example above, you can see two available apps — Egnyte and Google Drive — with the Egnyte block expanded to show its 5 connections. Name: The name by which this connection will be referenced in the Workflows interface and elsewhere. Date: The date on which this connection was established. Active: A slider that lets you activate and deactivate the connection. Actions: A dropdown with additional connection actions, including deleting connections and viewing connection details. When adding a connection, be sure to give it a descriptive name — especially if you have multiple connections for the same app. This is necessary because once the connection is created, there is no way to determine what username and password were used for that connection. Therefore, it may be useful to include the username in the connection name. To delete an existing connection, expand the Actions dropdown next to the connection you wish to delete, and click Delete. Then click OK in the confirmation dialog box that appears. Be careful when deleting app connections — deleting a connection will permanently break any workflows that are using that connection. App connections can be temporarily deactivated and then reactivated. There are many reasons that you may want to do something like this. For example, suppose your corporate data storage policy changes, affecting how forms need to be stored in Egnyte. You may want to deactivate your existing Egnyte integration while you change your Egnyte folder hierarchy and corresponding GoFormz workflows, and then reactivate it. To deactivate or reactivate a connection, click the Active slider next to the connection you wish to change. When deactivating, you will need to confirm by clicking the red Confirm Deactivation button that appears; when reactivating, no such confirmation is needed. To view the unique app and connection IDs associated with a connection, expand the Actions dropdown next to the desired connection and select More Details. A dialog box will pop up showing the two IDs. These IDs may be needed when using the API. The only thing that can be modified about an existing connection is its name. To change other aspects of a connection (like the username or password, for instance), you will need to delete the connection and create a new one. To rename a connection, hover over the connection name, and click the Edit button that appears on hover. Then type in the new connection name and click Save Changes.